The Amazonian Manatee (Trichechus inunguis) is a species of manatee that lives in the freshwater habitats of the Amazon River and its tributaries. Amazonian manatees are aquatic animals. The Amazonian manatee come from the ‘Sirenia’ order and are also known as ‘seacows’. The Amazonian manatees colour is brownish grey and they have thick, wrinkled skin, often with coarse hair, or ‘whiskers’. Its main predator is man. The three species of manatees and the closely related Dugong, are unique in that they are the only plant-eating marine mammals in modern times. A somewhat unique feature (amongst mammals) of the manatee is the constant replacement of molar teeth. New teeth enter at the back of the jaw and replace old and worn teeth at the front. Elephants also have teeth that are replaced, but they have a limited set of these replacement teeth. The Amazonian manatee is a herbivore that feeds on aquatic vegetation near lake edges, such as aquatic grasses, and floating vegetation such as water lilies. Captive adults daily consume from 9 – 15 kilograms (20 – 33 pounds) of leafy vegetables. The Amazonian manatee occurs exclusively in fresh water. It prefers blackwater lakes, oxbows and lagoons and it has been maintained successfully in waters with temperatures of 22 – 30 deg C (72 – 86 deg F). 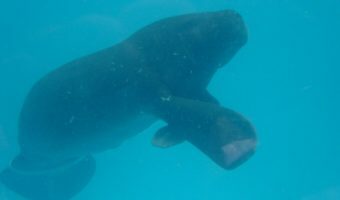 The Amazonian manatees key requirements in the wild seem to be large blackwater lakes or lagoons with deep connections to large rivers and abundant aquatic vegetation. 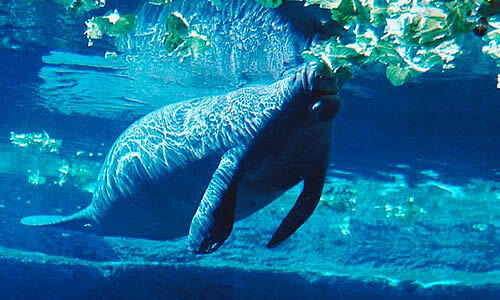 The Amazonian manatee is both diurnal (active during the day) and nocturnal (active during the night). The Amazonian manatee is entirely aquatic and never leaves the water. Amazonian manatees do most of their feeding during the wet season, when they eat new vegetation in seasonally flooded backwaters. During the dry season (September – March), when they congregate in the main river channels or in deep parts of larger lakes, they may fast for weeks or months for lack of available food plants. There have been reports of larger aggregations of manatees in the middle reaches of the Amazon, but the largest groups of manatees observed currently generally include only 4 – 8 animals. Most manatees observed are either solitary or a female with her young. The Amazonian manatee ranges throughout the Amazon River Basin of northern South America. 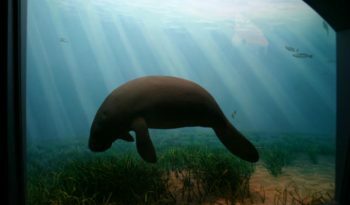 Its range sometimes has been said to include the Orinoco River Basin, but such reports apparently are based on misidentification of the American manatee in the early 19th century. The Amazonian manatee is also unlikely to reach the waters that connect the Orinoco and Amazon basins. It occurs at the mouth of the Amazon on the Atlantic coast. The gestation period of the Amazonian manatee is approximately one year. 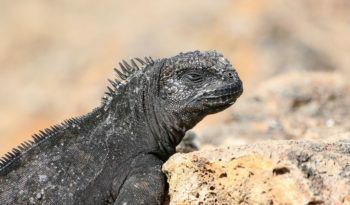 Breeding has been reported to occur throughout the year in some areas. However, it has been reported that births occur mainly in January in one part of Amazonian Ecuador and in June in another. Evidence also indicates that in the central Amazon Basin, breeding is seasonal, with nearly all births taking place from December to July (mainly from February – May, the period of rising river levels). One manatee calf is born with a birth interval of about two years. An Amazonian manatee calf measures about 30 inches (80 centimetres). The newborn calf is capable of swimming to the surface on its own. Calves vocalize at or soon after birth. This is an important part of the mother-calf bonding process. The manatee calf begins to nurse within a few hours after birth by suckling from a teat under the pectoral flippers. Calves nurse underwater. Calves begin nibbling on plants within a few weeks of birth. Although it may be weaned by the end of its first year, the calf remains close to its mother for up to two years. 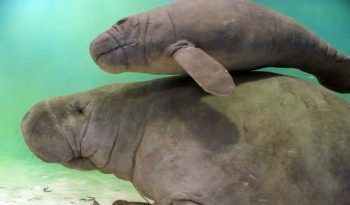 The manatee calf is dependent on its mother not only for nutrition, but also for learning about feeding and resting areas, travel routes and warm-water refuges. Female manatees carry calves on their backs or clasped to their side. Life span of a manatee can be up to 12 and a half years. The Amazonian Manatee is considered endangered by the IUCN. The Amazonian manatee has been heavily hunted by subsistence and commercial hunters. 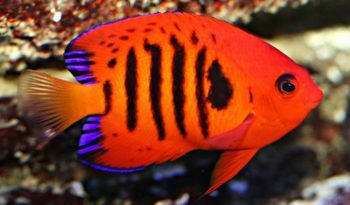 It has been sought for meat, oil and fat, and at one time for its hide, which was in demand for use as water hoses and machine belts. 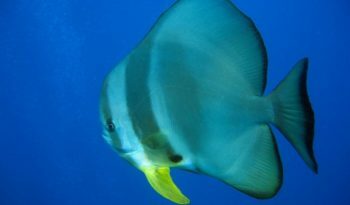 Other threats include accidental drowning in commercial fishing nets and degradation of food supplies by soil erosion resulting from deforestation. Amazonian manatee hunting has been prohibited since 1973.